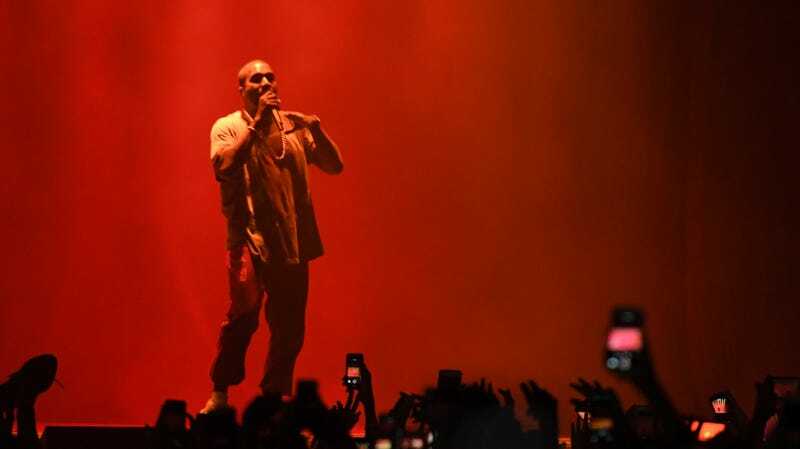 After a lead-up that involved multiple hours of inviting fans to watch a webcam pointing at a campfire burning somewhere in the middle of Wyoming, Kanye West debuted his eighth studio album tonight. According to West’s friend Chris Rock, who was on hand to introduce the album, it’s titled YE, and, as ever with West, it’s a mixture of the sexual, the political (“Russell Simmons want to pray for me too; I pray for him, because he got #MeToo’d”), the scatological, and most of all the personal, riffing on romantic relationships, identity, and more. West ultimately played half a dozen or so songs from the album before beginning to repeat tracks for the listening crowd. YE is reportedly scheduled for a full release tomorrow. Meanwhile, the WAV broadcast of the livestream is promising a repeat of the show shortly.